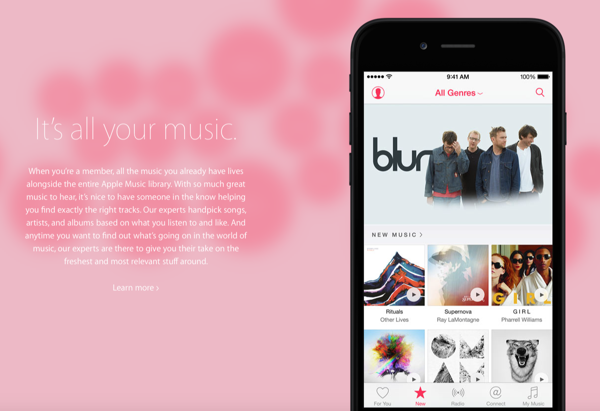 Apple Music streaming service has been officially announced. Complete set of features and details on how it works can be found right here. Rumored for a long, long time, the Cupertino tech giant’s music streaming has finally been announced on stage. Aptly called Apple Music, it’s very clear that the Cupertino company is making good use of its Beats Electronics acquisition in which the Beats Music streaming service was part of the deal. Apple is not pitching its new service in an ordinary way. 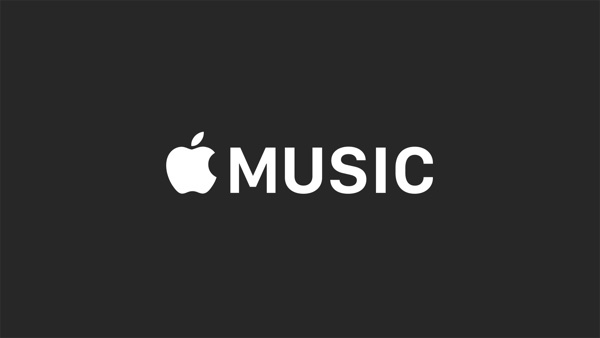 According to the company: “Apple Music is a revolutionary music service, a 24/7 global radio, and a new way to connect with artists.” That speaks a lot by itself, but we’re going to dive a little deeper to give you a glimpse of what Apple Music really is about. Unlike ordinary music streaming services – which we won’t name here, at all – the content on Apple Music is curated by “world’s leading music experts,” hence you can rest assured that you’ll stumble across the right tune every time. At least that’s what Apple wants us to believe. Apple Music is not about everything new, it also features your iTunes library, which means that all those tunes which you’ve come to love – and own – over the years will be up for listening at a moment’s notice. You either have the option to stream your iTunes tracks, or you can download them for offline listening. The music library in Apple Music is an almost 1 to 1 copy of iTunes, except for a few exceptions when it comes to artists, such as The Beatles. This means you can keep on listening to your music and you’ll never ever run out of stuff to listen to. Ever. Coming back to the ‘music experts’ bit we were talking about earlier, Apple says: “Get recommendations for albums and playlists you’ll love from experts — real people who know and love music.” Rather than let someone slightly off track choose your music for you, Apple is taking a more hands-on and professional approach in this department. 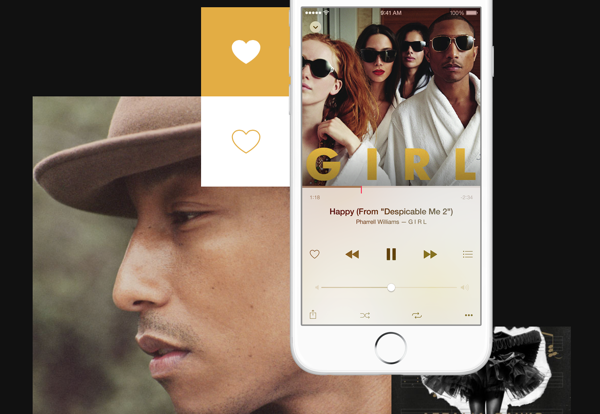 At this point you must be wondering; is Apple Music all about streaming music with no radio in sight? No, it isn’t. And according to Apple, its new service comes integrated with what they’re calling a “groundbreaking 24/7 global radio station,” which broadcasts non-stop music to 100 countries directly from LA, New York and London. 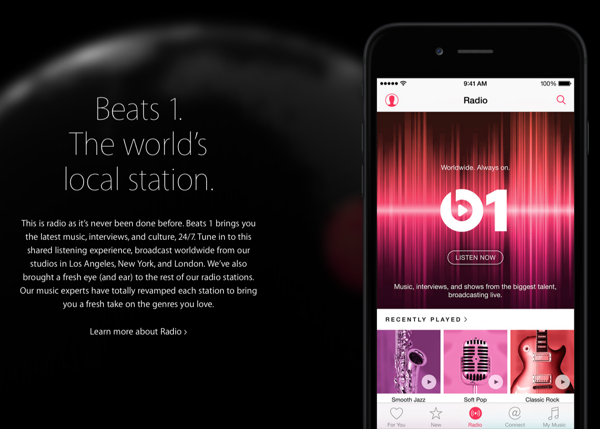 If you’re a fan of interviews, guest shows, news and culture, then you’ll be pleased to know that Apple Music comes bundled with ‘Beats 1’ which will be hosted by the world’s “best voices” such as Zane Lowe. But why should big name artists get to do all the good stuff, right? We agree, and that’s why Apple is letting unsigned artists – common people like you and me – share content with others too, which means your creative harmonies have a chance to be heard by the industry’s big guns. And if you’re lucky enough, even make it way big! If you are a music video fan then there’s good news for you as well; Apple Music hosts ‘ten of thousands’ of music videos, that too without a single ad in them. 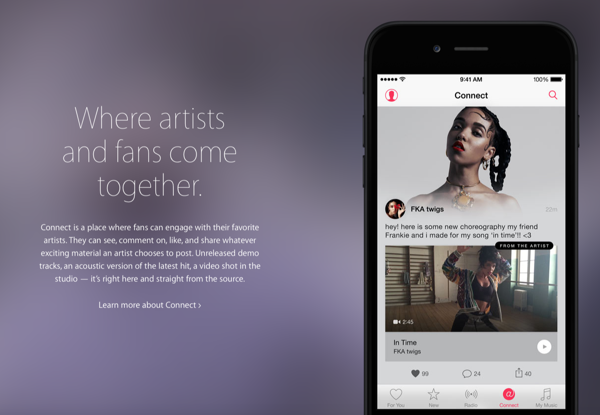 Apple Music also integrates with Siri, therefore your favorite songs or genres are just a voice command away. We bet you haven’t seen anything like this anywhere else, right? Yup, neither have we. Unlike Beats Music, Apple Music will live in iTunes on the desktop. 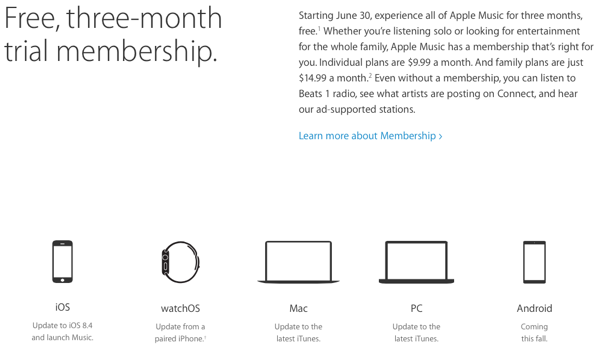 Apple Music will be available on June 30th in 100 countries, and will work on iPhones, iPads, iPod touches and Macs. For iOS devices, it will be a part of the iOS 8.4 update, due for release on the 30th of June. Windows and Android users get the taste of the action too, and they’ll be able to dive into the Apple Music action this fall. Apple Music will cost $9.99 a month for individual users, and Apple is throwing in a family plan too, in which 6 people can share one single Apple Music account for just $14.99. But wait, it gets better; Apple Music will be free for the first three months, giving every user ample time to decide whether or not they’re going to stick with Apple’s brand new service. Wow Apple spent all that money and this is it. The most annoying part is I really like spotify and now Apple play in this space they will start throwing their weight around and spoiling it for everyone to make a buck. they started already. Awesome can’t wait. Im still clueless as to just wtf this is? So it streams the music I already own, or do I have access to the iTunes library to stream? I wish you can “Offline mode” like Spotify does. Nevertheless, the free 3-months would be worth-a-try. Maybe it’s Apple’s way of creating a music experience without the need of sacrificing the storage of the devices. I’m a current iTunes Match user, will I have to purchase this service on top of my current subscription. Ie. are they throwing anything in for those already subscribed to Match? I’m aware it’s a different service, but streaming my own iTunes library is actually what I was hoping Match did…. ? Let’s hope it can offer more than what Pandora does currently not just current new music but old skool stuff too.